It's a patently absurd setup on any number of levels, and everyone involved is acutely aware of this. What follows can only be described as a blackly comic farce, as the plot complicates in increasingly insane and incredible ways. It's all to basically set the stage for an extended, surrealist finale, where the feces finally hits the rotating blades to giddily disgusting and hyperbolic effect. There's a bit involving Gina Gershon and fried chicken that is so bizarre, misogynistic and strangely disturbing that the only appropriate reaction is to laugh. Sure, there are thriller elements, but if you're in tune with the tone there are laughs a plenty here, and ones that have happily earned the film an NC-17 rating in the country of its origins. Political correctness be damned. The characters are all pretty much various levels of caricature, but the performances wring out plenty of the script's comic potential. Hirsch is basically the straight guy, but is such a despicable and desperate individual the audience will probably welcome the various misfortunes that befall him. Church plays Ansel as an hilariously apathetic and gullible slacker, and is the most obvious 'comic foil' of the script. Temple, in various states of undress, further proves herself as one of the most eccentric yet endearingly offbeat young actresses of the moment. With a strange combination of girlish innocence and psychological torment, Dottie - who is the only character to undergo any sort of significant development over the course of the narrative, arguably making her the tale's protagonist - is almost a parody of the 'manic pixie dreamgirl' archetype that currently plagues American independent cinema. Yet it's McConaughey who will attract the most attention, and if he want to shake off his rom-com friendly image, he could barely have picked a better script. There's hints of Patrick Bateman in there: that same perverted sleaziness countered by a hard-to-define boyish charisma. But Joe is his own entity too, and McConaughey strikes a solid balance between parody and menace. Not quite your average screen sociopath, McConaughey gets a plethora of ironically iconic moments that may or may not earn the film a cult following. You can never tell with these things, can you? Killer Joe is not a film one exaggerates about. It's theatrical origins are abundantly clear, through both a relatively small cast and a limited number of locations (several claustrophobic scenes go on for ten-twenty minutes). There are also times when the film's tonal balance seems a tad lopsided: verging too far into broad comedy, or a few potentially creepy story plants early on that bizarrely aren't referenced again. Caleb Deschanel's cinematography occasionally captures a sense of Southern grit and impending doom (like the flashes of lightning and torrential downpours that litter the film), but sometimes the overall look of the film feels a little incohesive. Yet ultimately Friedkin's direction is confident, as are the ensemble, and the film emerges as a thoroughly enjoyable slice of insanity. Like many of the great comedies, it amuses as often as it surprises. 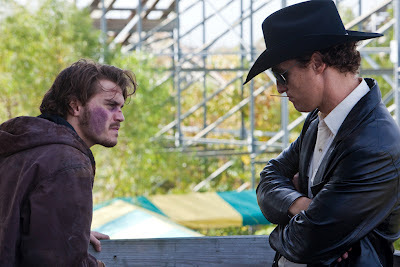 And when the film invites both disgust and belly laughs, Killer Joe is at it's blackly comic best.